summary of how we intend to build and maintain a vibrant economy. Our plans for economic growth encompass all social strata of Dominicans, local and in the Diaspora. The implementation of our economic agenda will ensure that the average citizen enjoys an uplifting not only in income but also morally and socially. To the average Dominican family, it will mean more money to put food on the table though, but not limited to, more job availability, higher tax deductions, and employment incentives. To the Dominican youth, it will mean more options for training programs, a very robust job market, and more availability to sources of financial and economic support. In order to resuscitate the moribund Dominican economy, it is imperative that we address the key factors of growth – capital, labour, and productivity. These key economic inputs will result in the abounding of the Growth Domestic Product (GDP) to projections of over 7 percent growth per year for the first three years in office. In adherence to the mandates of the United Nation’s 17 Sustainable Goals, GDP will exceed 9 percent per annum in order to eradicate any and all forms of poverty in Dominica. Our economic agenda will thrust Dominica into the competitive ranks of the top three regional performing economies. For the past fifteen years or more, our capital assets have been under-utilized thus resulting in unnecessary expenditures, faster-than-expected write-offs and write-downs, and a forfeiture of an economic competitive advantage. In order to make full use of capital assets, it is necessary that we derive the intrinsic value of what already exists, and correlate them to the means of attaining the broader set of long-term goals – 2030 deadline. For example, we intend to reduce the public debt-to-GDP to 50 percent by 2030 and maintain a budget deficit-to-GDP of no higher than 5 percent. We will seek to break the monopoly that utility companies exert on Dominicans. We believe that fairer competition among water and electricity providers will mean cheaper rates and better quality services for Dominicans, which therefore means more disposable income at the hands of Dominican citizens. Controlled-for inflation is necessary to stoke a healthy economy. The rate of inflation in Dominica is unhinged from the real economy, artificial more so in nature. The current inflation rate of 1.7 percent imbues perceptions of a healthy economy, but the reality is different. The change in the Consumer Price Index (CPI) since the early 1990’s measures a stagnant economy, one where the prices in the basket-of-goods were already exorbitant. From the 1990’s till current, any minor uptick in price is felt by the consumer because of thinly stretched incomes and a high unemployment rate. While we cannot speculate on what the intrinsic inflation rate is, we can safely say that if we’re to change the base period of the basket-of-goods to an earlier time, and use only two CPI reference points, the years 1990 and 2005, inflation would be over 100 percent. In keeping in line with the tenets of accountable reporting, we will overhaul and revamp the manner by which GDP and other economic indicators are reported. A healthy rate therefore of 2 to 3 percent per year falls in line with our objective to achieve a 7 and 9 percent economic growth in the first three years and thereafter, respectively. Labour, as a factor of production, remains negatively exploited. Low pay, victimization, and preferential treatment are some of the factors which contribute to the low quality of labour in Dominica. The current minimum wage rate of EC$4.05 per hour translates into an unending cycle of poverty for those families and individuals struggling to make it on such. One of the first issues that we will tackle, is the hiking of the minimum wage to EC $7.50 per hour. than previously utilized modus operandi. 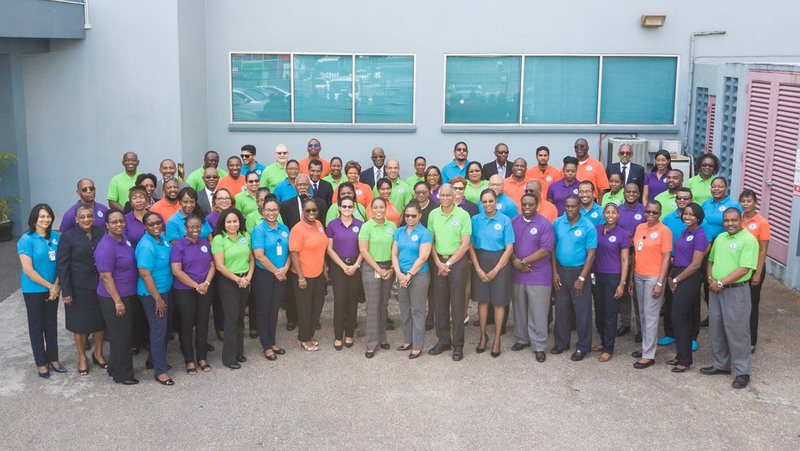 We aim to enhance the quality of labour in Dominica by ensuring a more equitable workplace. One where labour disputes are more quickly settled under a new system, rather than under current regulations. Incentives will be granted to employers to enhance meritocracy in the workplace. With aggressive/robust job creation, plan, unemployment is expected to be stabilised at 11 percent, compared to 28 percent over the past decade. A number of factors have led to the decline of productivity in Dominica, aspects we will reverse once taking office. A prominent culprit responsible for the deterioration of productivity is inefficient allocation of resources. Take for example how revenue from the Citizens By Investment (CBI) program is managed. Over three-quarters of CBI derived funds are either ploughed in operating expenditures or invested in projects where the potential for sustainable profits are uncertain. Our plan includes not only drastic modification of the CBI but ensuring that over 90 percent of returns are invested in sensible, profit-generating projects, projects that are long-term and contribute significantly to the Dominican economy. Historically, poor safeguards have existed in regards to the proper accountability of public funds. We will establish a public-accessible database which shows real time, the expenditure of every cent of the public’s money. We will also implement strict systems of audit and transparency, such procedures original only to our plan for more open government. Another economic-development-inhibiting factor are the attitudes of the citizenry, particularly the youth. The youth are the future of any country. We will see to it that Dominican young men and women get much-needed morale support and the provision of income-generating avenues. As mentioned elsewhere in the message, attractive compensation packages and the ensuring of markets for our produce are factors which will boost productivity. We also have a unique situation, which is so much more can be accomplished agriculture-wise through proper management of our rugged terrain. The agriculture section in our manifesto explains our approach to advising and incentivizing farmers and landowners in that regard. The first item on our economic agenda addresses the local income tax code. The PAYE structure will be changed to reflect the impact of commodity prices, fairer economic class contribution, and consumer purchasing power. For instance, an individual earning between EC$ 0 to $35,000 will pay no income tax. The current range is between $0 to $25,000 to exempt one from taxes. An individual earning between $35,000 to $55,000 will pay 20% income tax; from $55,000 to $100,000, 25 percent tax; and then a flat tax of 35 percent for individuals earning over $100,000. The tax code is not clear with respect to personal income tax filing statuses. We intend to address the current vagueness of the tax code with respect to individuals who wish to file jointly, with incentives and fairness in doing so. For instance, while an individual earning between $0 and $35k will pay no tax, a married couple earning between $0 and $60,000 and filing jointly will pay no income tax. However, married-filing-jointly taxpayers will be able to deduct up to $35,000 in mortgage interest payments (currently, $25,000). Married first-time homebuyers will also be able to deduct a portion of the loan/mortgage principle when filing jointly. All members of the Dominica Diaspora will be entitled to tax holidays (both on income and corporate tax), depending on the amount of capital investment and type of business they intend to establish. For example, a returning Dominica who wises to set up a grocery shop as a sole proprietor for an investment amount of some EC $80,000, will only be entitled to the tax relief for the first year of operations. Whereas, a returning Dominican who wishes to invest in an organic agro-manufacturing plant for an investment of over $250,000, will be entitled to pay no corporate tax for the first three years of operations, plus some relief on her/his personal taxes. In terms of corporate taxes, tax rates on local agro-related manufacturing companies will be reduced to 15 percent. Also, local agro-related manufacturing companies will be eligible to write-off in taxes, the first two years of losses against any future business capital gains. Any local construction company that carries out over 20 percent of business operations outside of Dominica, employs a majority of Dominicans as staff and realizes revenues from such operations shall only pay 12 percent corporate tax. We will implement an attractive incentive scheme whereby qualifying businesses shall be eligible for a tax holiday. Tax holidays will vary between one and two years. In order to qualify for the tax holiday scheme, all a business has to show is a steady increase in the employment of local Dominicans over a set time period. We will eliminate the fixed 10 percent corporate tax rate on Dominica-source income for international corporations. Instead, a variable tax rate (maximum 10%, minimum 0%) will be implemented which will factor in the number of local Dominicans employed, the percentage of business operations conducted in Dominica, and the trade-based relationship with local businesses. Just to elucidate on the last criteria, an international corporation would pay less taxes if it purchased raw material and services from local based companies. We will restructure our current pension system. Such restructuring will include allocating the value of current unfunded liability pension amounts to realistic future asset values. These realistic future asset values are currently non-realizable because of the short-sightedness of the current regime. include adding programs to the DSC and institutes that will train to build capacity. With the DSC offering bachelor’s and master’s degrees, these will encourage our local students to remain at home. These two areas, education and health, are thoroughly expanded on further in the manifesto, so we won’t say much here. The economic pillars will be agriculture and agro-processing; tourism; Information Technologies (IT); other manufacturing including the production of automated technologies; and financial and consumer services. Agriculture will play a pivotal role in re-igniting the economy of Dominica. Currently, it only accounts for some 13 percent of GDP. According to our timescale, agriculture and agro-processing will account for over 40 percent of GDP by our third year in office. This will be made feasible through the establishment of contract farming, vastly improved farming methods, and an aggressive system of marketing. Our innovative yet rational approaches to jumpstarting the agricultural sector is explained in the manifesto. Among other groups, farming contracts will be established with the Kalinago people, for whom we will vigorously lobby for a semi-autonomous form of government. We believe that by giving the Kalinago people more of a say in determining their economic and financial affairs, could enhance revenue generating creativity and attract more foreign direct investment. Much in line with the rehabilitation and invigoration of the agriculture industry, will be the inclusion of policies and technologies to address climate change. We have witnessed first hand the consequences of climate change when Erika wreaked havoc on our dear land. We are seeing more and more cases of soil instability, and rivers increasingly overrunning their banks upon any tropical depression. Through solid education aimed not only at school children but at the general population; the offering of incentives to use environmentally friendly products; and the encouragement of recycling, we believe that we can play our part by slowing down the climate degradation process. Tourism will be revamped to include a more creative sector and another cruise ship berth – this one more in line with our Nature Island setting. We intend to make the most of this era of increasing reliance on automation, by seeking and offering very attractive incentives to investors to set up simple robot manufacturing plants. Financial and consumer services will expand not only to include call centres and offshore banks, but also accounting and human resource functions of multinational corporations. While tourism will account for around 15 percent of GDP, financial and consumer services will contribute some 15 percent. We expect about 20 percent of GDP to be derived from other manufacturing which will include robotics and artificial intelligence machines. CBI or economic citizenship revenue is expected to dwindle to less than 10 percent of GDP by our third year in office. The contribution of exports to the growth level is projected to increase by over 40 percent per year. In lieu of the reliance on the current CBI structure, we will introduce a refugee resident programme, whereby we will host refugee individuals and families. It is estimated that the average individual refugee costs the US government some US $35,000 per annum. We could host refugees at three-quarters of that cost plus still get financial incentive for doing so. Of course, the costs would be borne by NGOs, charitable organizations, and/or United Nations programmes. We estimate that if we host 3,000 refugees, we could easily realize over USD $10 million per year in revenues. Naturally, there would be a hosting life to respective refugee groups. To be clearer, refugees after a set number of years would be expected to either integrate and contribute to the Dominican community as fully fledged citizens or leave. After that refugee-resident qualifying time has passed, financial and economic sponsorship will cease, and we will no longer be able to realize revenue. The People’s Party of Dominica will be known for, if anything, the introduction of an electronic marketplace (767Onlinemarket) to serve the needs of the citizens of Dominica. The online marketplace would give Dominicans a chance to shop for quality goods overseas, and would also expose the world to locally manufactured goods and services for sale. This would accelerate VAT revenue because of the ease by which Dominicans can order goods from overseas. Our marketplace would allow vendors and manufacturers to advertise and sell their goods to a global audience. The difference between 767Onlinemarket and say, E-Bay will be the incentives offered by the government to exporters to use it. For example, some export items, depending on the quantity exported, will qualify for a partial reimbursement of shipping costs. Other advantages of having an electronic marketplace include 1. Additional means of generating revenue that otherwise would not have been “realized”; 2. The addition of jobs at the ports, post office, and in the customer service sector; and 3. The ability to derive a more real-time understanding of the intrinsic demand-supply scale balance value. We shall embark on one of the most aggressive economic stimulus packages in Dominican history. Our infrastructure – roads, bridges, residential and commercial buildings, are in desperate need of repair and upgrades. Probably the biggest infrastructural project would be the expansion and/or construction of seaports and airport. Our goal is to make Dominica the biggest transhipment point for seaborne goods travelling from Mexico and Central America to West Africa and Europe, and vice-versa. Because of our geographical location, it would be cost effective for example, for cargo vessels travelling from the Panama Canal to West Africa and onwards to Europe. Most vessels from Central and South America either travel to Trinidad or to Puerto Rico before heading to West Africa and Europe. A few others use a route north of Guadeloupe. We envision the construction of a massive deep water harbour around Cape Melville, one at least five times the size and ship-holding capacity of the current harbour in Fond Cole. In order to finance such, we will float bonds and seek investors world wide. Annual revenues from an operational port should surpass USD $20 million for the first few years. Income will increase however, as traffic flow increases. and cannabis-related products. Global legal revenues in 2016 were estimated to be USD $15 billion. We have pinpointed an area where others have failed, and that area is so critical that we will invest unspeakable amounts just to ensure its sustainability and rewards. That area is marketing. We as a previous British colony enjoyed protective status which in turn fostered an atmosphere of non-competitiveness and lackadaisical attitudes. Not to say that the protection of our bananas was a bad thing, but it stymied our ability to do for ourselves and to fiercely compete on a global scale. With just as much zeal as Dominican passport selling agents pursue passport-buying-potential clients, so too will we expect that of our marketing agents. We will place high emphasis on the ability to secure exclusive rights contracts, lock-in agreements and the maintenance of such. Our local manufacturers will enjoy massive increases in global market share, thanks to our unique relationship with China. We will seek to establish MOUs with large Chinese manufacturing companies to either outsource some work to local firms in Dominica, or to have local companies share in their export markets. We intend to move away from an aid based relationship to one where mutual understanding encompasses our economic development, increasingly by our own abilities. We will establish contracts with world renowned and aggressive marketing firms to internationally sell Dominican produce. Such produce may be raw or finished for consumption/enjoyment. One of our goals for small businesses and manufacturers (depending on the business) is to have at least 70 percent of what they produce for the export market. One of the big tasks for our marketing agents is the job of placing Dominican produce on the shelves of every major supermarket in North America, the UK and most of Western Europe. Other plans to energize the economy include the investment in arts and culture. Dominica as the Nature Isle has a rich heritage and quite a colourful history. More can be done, especially in terms of tourism, in enhancing our culture through increased budget expenditure in that area; the hosting of more heritage-related theatrical events; and the export of culture through say, travelling shows. Dominica is in need of a proper theatre building. We are not looking at just the material aspects of the economy, but how meaningful will an economic increase impact the lives of Dominicans. At every step in the development process, we will address questions like: 1. Does everyone have the basic needs of society, like water and sanitation which is a mandate on our constitution? ; 2. Does everyone have access to affordable medical care and more-than-adequate food supplies? ; 3. Does everyone have the basic building blocks for a better contemporary life, which includes information and communication, and access to health and wellness awareness? ; 4. Does everyone have the opportunity to improve their lives, through, for example personal rights, personal freedom and choice, tolerance and inclusion, and access to advanced education? While GDP is a general economic benchmark, we will monitor and measure our performance through means like the Social Progress Index – a measurement of the well being of society through variables like social and environmental outcomes. PPOD is committed to improving the state of Dominica. To do so, our team of progress leaders engage to shape local, global, and industry agendas while upholding the highest standards of governance. Moral and intellectual integrity is at the heart of what we do. The actives that we partake in are shaped by the unique party culture, which asserts, each one of us who makes up this party is accountable to all parts of society. It is our belief, that progress happens when people from diverse backgrounds, with drive, passion and influence, join together to bring about positive change. Therefore, with this zeal and passion for the sustainable development of the Commonwealth of Dominica, we are highly optimistic about the future. Disclaimer: This post is sponsored on tdnradio.net to provide you the most up to date facts, helping you make better-informed decisions. All opinions in this article are my own. Tdnradio.net is not responsible for any of the claims made in this post.